One of my favorite winter drinks at Starbucks is the cinnamon dolce latte. Technically, the cinnamon dolce latte is not one of their seasonal drinks (you can get one all year long! ), but I think it’s the perfect warm beverage for snowy, January days like today. It’s sweet, spicy, and caffeinated – three of my favorite things. 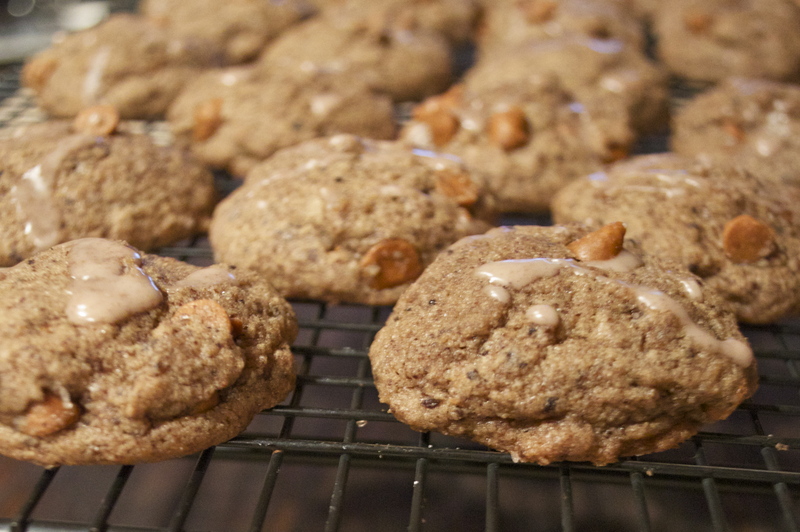 Cookies are also a favorite of mine, so today I’m baking whole wheat cinnamon dolce latte cookies. Starbucks has long been an inspiration for my baking endeavors. I’ve made dirty chai (a chai tea latte with a shot of espresso!) sandwich cookies, pumpkin spice latte pancakes, and many more. But I’ve never tried to recreate the flavor of the cinnamon dolce syrup. Though the flavor is a little spicy, it’s very sweet, so simply adding cinnamon doesn’t have the same effect when baking. Recently I found the perfect ingredient to make these cookies a cinnamon dolce delight – cinnamon chips. Cinnamon chips can be found in the food store, but they are usually only sold around the holiday season. These chips taste like white chocolate and cinnamon, making them a good balance of sweet and spicy. First preheat the oven to 325°F. In a medium bowl, whisk together the flours, espresso powder, baking soda, and salt. In another bowl, beat the butter and brown sugar until well combined. Turn the mixer to low and add in the egg and vanilla extract. Once combined, slowly add the dry mixture into the wet mixture, being careful not to over mix. Finally, fold in the cinnamon chips, and drop tablespoon-sized balls of dough onto an ungreased cookie sheet. Before placing them in the oven, sprinkle the tops of the cookies with cinnamon and sugar. Bake the cookies for 10-12 minutes, or until the edges just start to brown. Immediately transfer the cookies to a cooling rack. While the cookies cool, whisk together the confectioner’s sugar and cinnamon in a small bowl. Add water, a teaspoon at a time, until the glaze is thin enough to drizzle. Once the cookies are cooled completely, drizzle the glaze over the cookies. Pour yourself a glass of milk, dunk, and enjoy!